For this project you will be creating a personal alphabet! Your paper will be 21"x 16". You will need to break it up into 28 boxes, so that each letter can have it's own section. The last two can be used in any way you would like! 1. Generating Ideas - Brainstorm ideas about your Alphabet. Are you going to have a theme? What can you add to your designs to completely fill in each box? Will you tell a story in each box? Will the object you draw start with the letter? Think about your style and brainstorm/research ideas for your project. Consider both a lettering or font style, as well as, the image. 3. Visual Development - Begin by sketching out a few ideas to figure out what direction you will take this project, then begin drawing! Begin by dividing your paper into 28 boxes that measure 3" x 4". The paper should be turned horizontally with the 3" measurement going across and the 4" measurement going down. The best measurements include 3 measured marks that are connected. For example, I would make my first 3" line by measuring over 3" at the top, center and bottom of my paper. Once I have made my 3 marks, I will lay my ruler down against the 3 marks and connect them with a single line. You will have 2 empty boxes left over. Leave one and put your name in the other. 5. Refinement - Ask 3 people what is working and what needs to be improved. 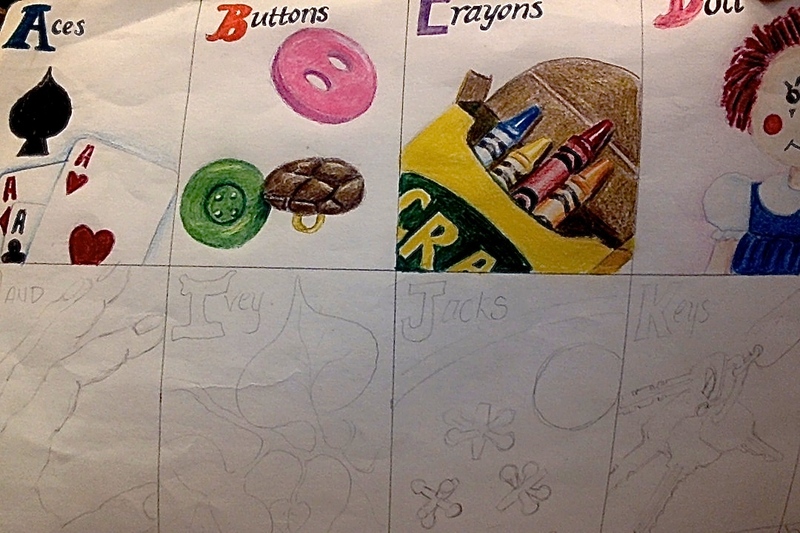 Make changes as necessary- erase pencil marks, clean up color pencil lines, etc.